Although it has been long known that on mixing certain salts the resulting substance possessed a lower melting-point than either of the constituent salts alone, still but few determinations of the melting-points of mixtures of salts have been made, and even these are often of small value, on account of the very considerable range of temperature observed during solidification. This is due largely to the fact that eutectic mixtures were not known, as equivalent proportions of various salts have been employed, while eutectic mixtures are seldom found to possess any simple arithmetical molecular relationship between their constituents. Eutectic salt alloys closely resemble cryohydrates in behavior. If for simplicity we confine our attention to a fused mixture of two salts in any proportion other than eutectic, it is found that, on cooling, the thermometer falls steadily, until at length that salt which is in excess of the proportion required for a eutectic mixture begins to separate out. If this is removed, the thermometer falls until a fixed point is reached at which the temperature remains stationary until the whole of the mixture solidifies. On remelting, the temperature of solidification is found to be quite fixed, and the mixture is evidently eutectic. It is of interest to notice that from our knowledge of the cryohydrates it becomes possible to predict the existence, composition, and temperature of solidification of a eutectic alloy, if we are previously furnished with the melting-points of mixtures of the substances in question. Or, in other cases, we may predict from the curve of melting-points that no eutectic alloy is possible. As an example, we may take the determinations of the melting-points of mixtures of potassium and sodium nitrate by M. Maumené.5 These are graphically represented in Fig. 1, the curve being derived from the mean of the temperatures given in the memoir. From this diagram we should be led to expect a eutectic mixture, since the curve dips below a horizontal line passing through the melting-point of the more fusible of its constituents. From our curve we should expect a eutectic mixture with about 35 per cent. KNO, and with a temperature of solidification below 233°. Dr. Guthrie gives 32.9 per cent. at 215°. 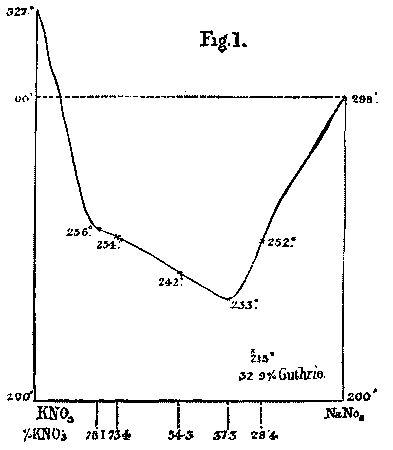 This agreement is as good as might be expected when one remembers that the melting-points, not being of eutectic mixtures, are difficult to determine, and a considerable range is given; that analyses of mixtures of potassium and sodium salts are apt to vary; and that the two observers differ by ±7° in the temperatures given for the melting-points of the original salts. Dr. Tilden has drawn my attention to an interesting example of the lowering of melting-point by the mixture of salts. The melting-point of monohydrochloride of turpentine oil is 125°, while that of the dihydrochloride is 50°; but on simply stirring together these compounds in a mortar at common temperatures, they immediately liquefy. Two molecules of the monohydrochloride and one molecule of the dihydrochloride form a mixture which melts at about 20°.